The most important Coatings Industry Suppliers is mobilizing to participate of EXHIBITION of ABRAFATI 2019. São Paulo Expo has become the largest event venue in Latin America over the last years after receiving investments from a large event service provider operator. In spite of these investments, the hotel infrastructure didn't expand with the same speed to the region, which still lacks good options. 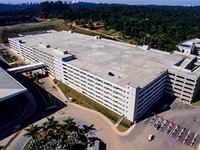 The hotel options closest to the venue are located around the domestic airport Congonhas, which is approximately 7 kilometer from São Paulo Expo. However, we recommend you to select an option just 1 km farther in the Moema neighborhood, which has more stores and restaurant options.